Flour, salt, shortening and water are the basic ingredients of pastry. One cup of sifted all-purpose flour to 1/3 cup of shortening is the proportion which gives the ideal crust if manipulation and baking are correctly done. The proportion of flour to shortening can make the difference between a crisp tender flaky crust and those that fall short of this ideal. Too little shortening makes a thick doughy crust; too much makes a too-delicate crust. With too little water the dough will be crumbly and will not hold together when rolled; with too much it will be sticky and hard to roll, and as the proportion of water is increased the finished pastry will be increasingly tough. About 3 tablespoon of water to 1 cup of all-purpose flour and 1/3 cup of shortening is the correct proportion. Correct mixing is as important as proportions of ingredient. The flour and salt should be mixed and the shortening cut in with a pastry blender or two table knives. Cutting the shortening in very thoroughly gives a tender crust, cutting it in coarsely a flaky one; the manipulation described under plain pastry suggests that half of the shortening be cut in until the mixture resembles corn meal - this for tenderness; and the remaining half be cut in only until the particles of fat are about the size of navy beans - this for flakiness. The water should be sprinkled a little at a time over the surface of the flour and fat mixture, then blended by pressing the wet particles of flour together and tossing them to one side while a dry portion is sprinkled. Never use a stirring motion. The tines of the fork rather than a spoon should be used for this purpose. When the dough has all been moistened it should be gathered together in a ball with fork or fingers, then pressed together, avoiding a kneading motion. An easy way to do this is to turn the dough out on a piece of waxed paper, rap it up and press. Too much mixing or too much handling after the water has been added makes a tough crust with a smooth pale surface. The dough may be rolled out immediately or it may be chilled before rolling. Chilling helps to make a flakier pastry. Care should be taken, however, not to overchill it, especially if it is put into a mechanical refrigerator. Twenty minutes to a half-hour should be enough. Deft, light strokes of the rolling pin and not too much flour on the board are essential. Place a ball of pastry dough on a board lightly floured to prevent sticking. A correctly mixed pastry may still be turned into a tough streaked doughty crust by letting it take up too much flour from the rolling board. A pastry cloth or heavy canvas cover for the board and a stockinet cover for the rolling pin take all the risks out of rolling pastry. Roll quickly and lightly, always from the center out, until the dough is about an eighth of an inch thick. As the rolling pin approaches the edge of the dough on each stroke, it should be lifted, never rolled on over the edge. Rolling over the edge makes the edge too thin, hence gives it a tendency to split. Any split that does occur should be pinched together before the rolling is continued. If the dough sticks to the board it should be loosened with a spatula slipped under it and a little flour sprinkled on the spot. The dough should be lifted frequently during the rolling, but should not be turned over. When the dough has been rolled to a shape and size to fit the pan in which it is to be baked, fold it in half and lift it carefully into the pan, with the fold in the center. Unfold the dough and fit it loosely into the pan, taking care to make it fit snugly into the seam where the sides and bottom of the pan join. Stretching the dough in the pan will make the pastry shell shrink during baking. When the dough fits properly, pat it all over its surface to eliminate any air pockets underneath - a little ball of dough is useful for this. Then the edges should be cut according to the kind of pie. Prick the pastry shell with a fork to allow the escape of any air between crust and pan. Bake on the upper shelf of an oven preheated to 450º F to set the edges quickly and prevent the shell from shrinking. Transfer to the lower shelf of the oven after the crust is set if the edges are in danger of getting too brown before the rest of the crust is baked. If the shell bulges during the first moments of baking despite the preliminary pricking, prick it again and it will lie flat. Once the pastry has set it will not bulge. Another way to prevent bulging is to place a second pie pan of the same size inside the pastry-lined pan - or a double layer of dried beans will hold the pastry flat. The pie pan or beans should be removed before the shell is fully baked to allow the bottom to crisp. Pies filled before baking should be baked on the lower shelf of an oven preheated to 425º F to allow the filling to cook through before the crust is too brown. Brushing the top of a double-crust pie with milk or diluted egg yolk will give it a rich brown color when baked. Custard Pies// Have the shell thoroughly chilled before putting in the filling. Have the filling hot and put it in the shell at the last moment before the pie goes into the oven. Fruit Pies// Mix the flour and sugar in the proportions recommended in the individual recipes. Spread half of this mixture over the bottom of the pastry-lined pan. Add the fruit and sprinkle the remainder of the flour-sugar mixture on top. The flour and sugar under the fruit catches the juices of the fruit as they run out and thickens them before they are soaked up by the pastry. Sift flour; measure; add salt and sift again. Using a pastry blender or 2 knives, cut in half of the shortening thoroughly or until mixture resembles coarse corn meal. Cut in remaining shortening coarsely or until particles are about the size of peas. Sprinkle water, 1 tablespoon at at time, over small portions of the mixture; with a fork press the flour particles together as they absorb the water; do not stir. Toss aside pieces of dough as formed and sprinkle remaining water over dry portions; use only enough water to hold the pastry together. It should not be wet or slippery. Press all together lightly with the fingers or wrap dough in waxed paper and press together gently. Bear in mind that the less the dough is handled the more tender and flaky the pastry will be. Chill dough. Roll out as directed above. 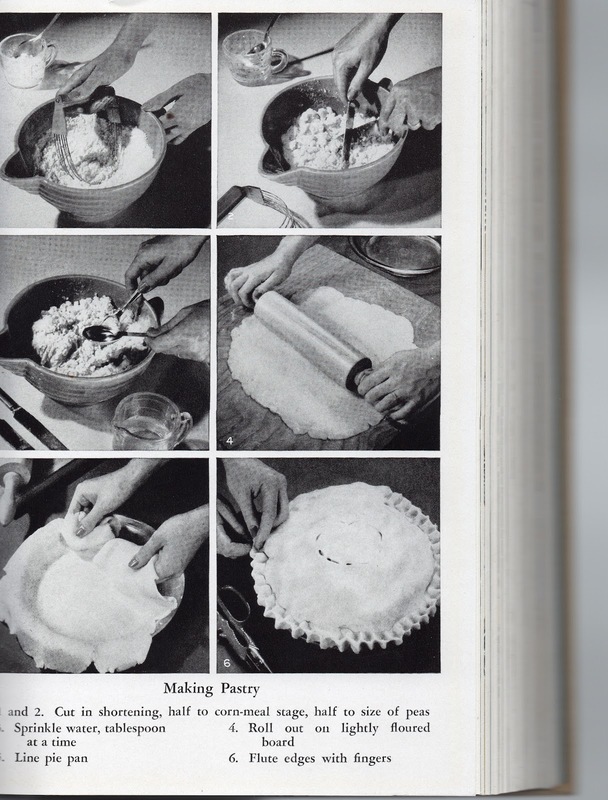 Makes two 9-inch pastry shells, one 9-inch two-crust pie or eight to ten 4-inch tart shells.